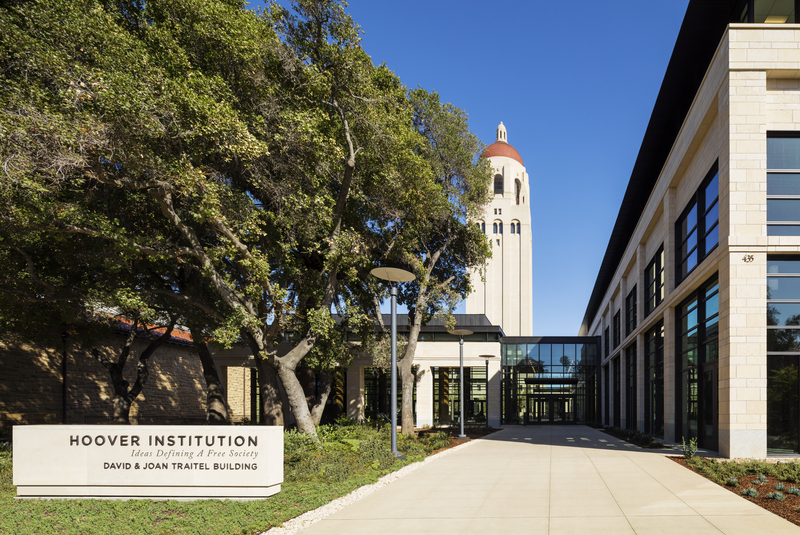 Opened in 2017 and named in honor of lead donors David and Joan Traitel, the beautifully designed Traitel Building sits at the foot of Hoover Tower and opens the Hoover Institution to the larger Stanford University community. The building’s first floor features several elegant, modern, and highly functional event spaces that we are pleased to share for events. This light-filled venue features excellent acoustics, state-of-the-art A/V capabilities, and theater-style seating for 400 guests. 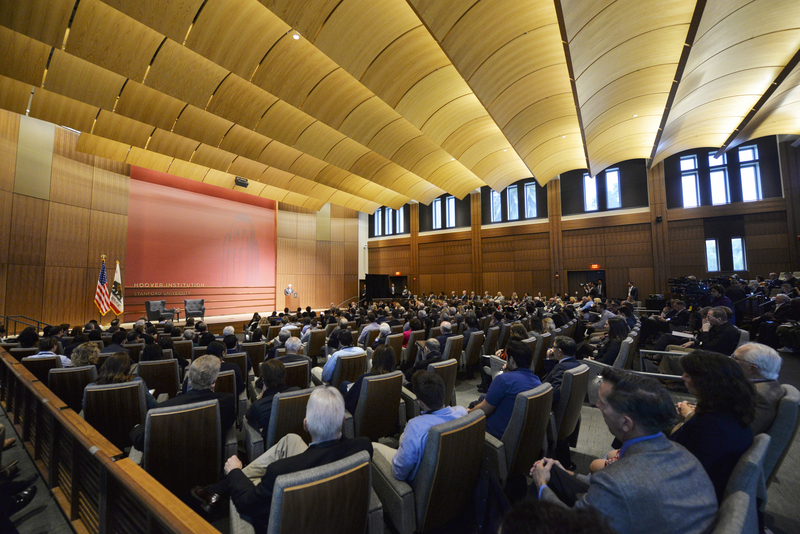 The distinctive, scalloped ceiling and wood trim finishes throughout set the lecture hall apart from other convening spaces on campus. Generously sized yet intimate, Hauck Auditorium is a noteworthy addition to Stanford University. Comfortable, theater-style chairs with arm rest, leg room, floor-fed climate control, and lap pad (Wheelchair accessible and removable chairs also available). 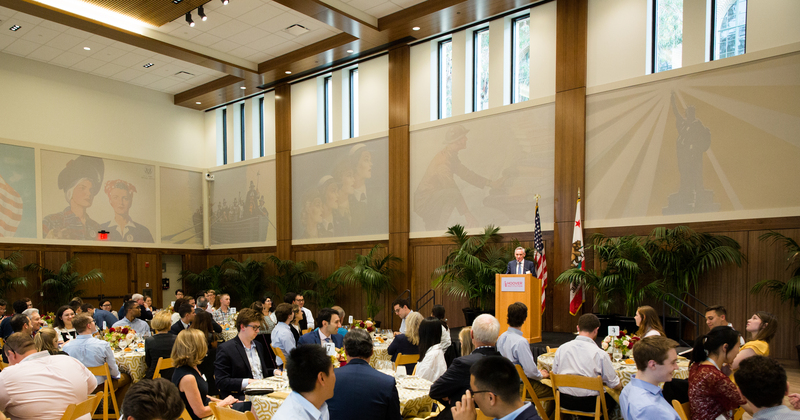 Decorated with posters from Hoover’s world-renowned archival collection, Blount Hall is a spacious dining and multipurpose room that seats 440 guests. The room opens to the building’s outdoor courtyard and Welcoming Pavilion/reception area, offering plenty of natural light and easy access to other spaces. Rental includes use of designer dining chairs and 66-inch round tables. This glass-walled room is adjacent to the building’s main Lasuen Mall entrance and lobby area. 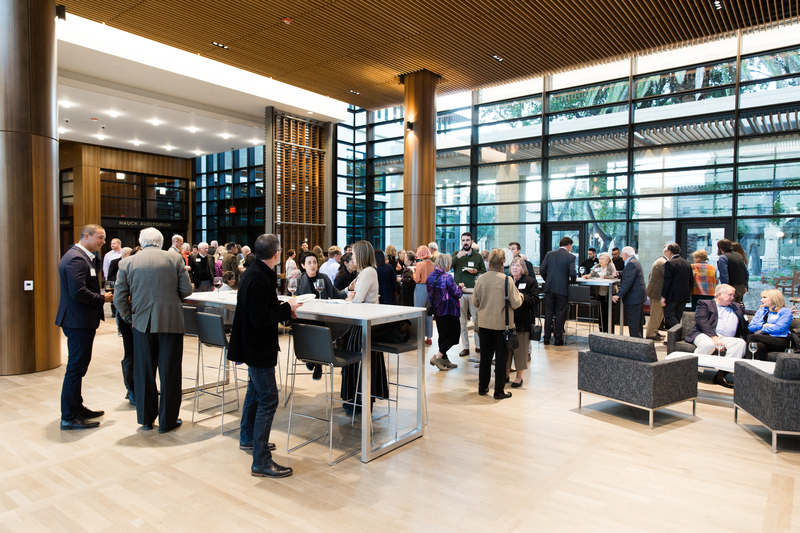 The pavilion opens up to the building’s semi-private courtyard and serves as pre-function space for the building’s dining/multipurpose room and auditorium. 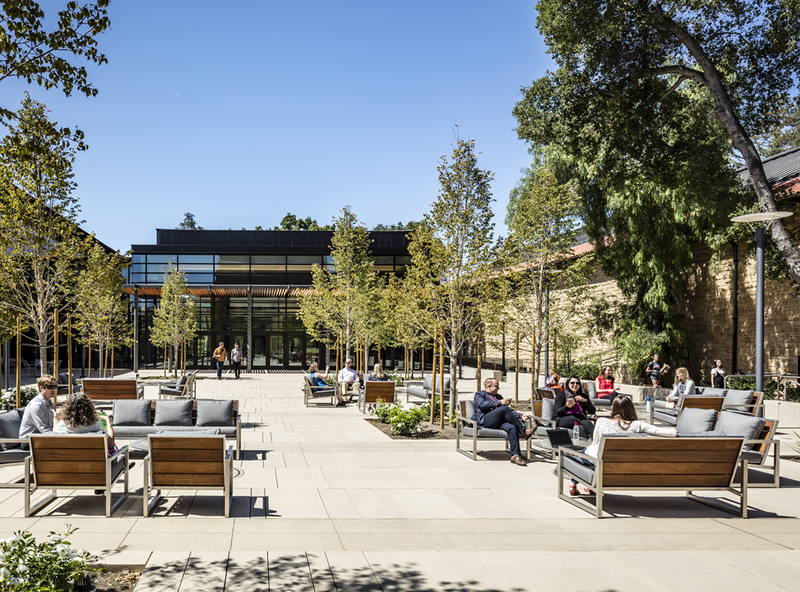 This beautiful outdoor space, sponsored by Hoover supporters Joanne and Arthur Hall, sits at the foot of Hoover Tower and looks out to Serra Mall and Tanner Fountain. It features comfortable patio-style seating, café tables and chairs, and easy access to the building’s indoor event areas. Additional seating available on surrounding seat walls. Events can take place any time between 8:00 a.m. and 10:00 p.m.
Hoover does not provide an event manager for outside events. For Traitel Building events booked more than 90 days in advance, Hoover can only offer a soft hold on dates/spaces. Full confirmation of dates/spaces becomes available once the event is 90 days away. 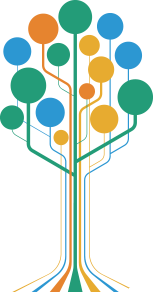 To inquire about renting space at Traitel, please click here. For additional information or other questions contact traitelevents [at] stanford.edu (subject: Traitel%20Events%20Inquiry) or call 650-721-7869.